During times of war and economic crisis, some believe deficits are a necessary evil. At the same time, some believe we should never run deficits. This debate is healthy. Journalists should press Obama and his congressional supporters about whether 2009-10 was a justifiable time to run a record deficit, and when and how Democrats are planning to reduce the deficit. But there is another part of the debate that also needs to happen. Journalists need to press the congressional teabaggers about what spending they would have foregone to prevent deficits, and then report about the consequences, according to experts, of such decisions. While reporting that questions Obama’s deficit spending is regularly being done, reporting that analyzes the consequences of the teabaggers’ laissez faire approach largely is not happening. If deficit hawks say Obama shouldn’t have created the deficit by spending on the Troubled Asset Relief Program (TARP), a stimulus package, the auto manufacturer loans, the middle east wars, preserving the Bush tax cuts during a downturn, and/or unemployment insurance claims, fine. But what do economic and foreign policy experts say the ramifications of such choices would have been? Yes, deficits are the result of deficit spending. We get that. But there are also consequences of NOT deficit spending during an economic crisis. Little items like financial meltdowns, collapse of our manufacturing base, much deeper joblessness, more foreclosures and bankruptcies, and the ripples all of those explosions would have sent throughout the economy. The deficit debate America needs must go deeper than “deficits: like or dislike?” Of course we all dislike deficits. But a healthier debate requires a bit more frontal lobe strain: “Under the 2009-10 circumstances, did the benefits of deficit spending outweigh the costs?” And that debate requires more facilitation and illumination by less passive national journalists. ← Where All the Children Are Above Average? What a hilarious chart. One is led to believe that Obama was hamstrung by Bush’s ill-advised first bailout. TARP II was just as stupid, and just as avoidable. 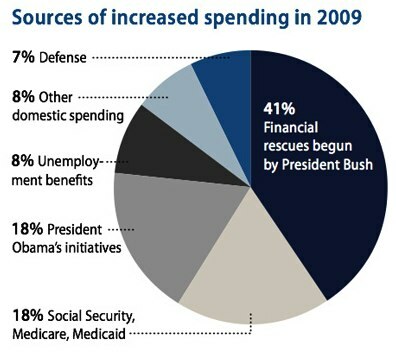 The chart does illustrate that most spending damage is not defense-related. Thank you for that much illumination. I agree that Obama could have killed TARP, and am relieved that he didn’t. The alternative — financial institution meltdown and consequent credit crisis — was much worse. I also agree that the deficit is only partially about wars, and am very comfortable with a debate about the domestic spending and what it prevented. How about too hot to handle? A UN security guard prevents a journalist from asking questions about Climategate. Thinking about the deficit, and our earlier discussion about economics and economists–here is an interview with Paul Samuelson, who was until yesterday the only living Nobel laureate economist to have survived the Great Depression. I read the Samuelson interview. I respect the guy, but I sure struggle with the proponents of Keynesian theory as much as the proponents of supply side economics. I think both are a bit of voodoo and rely on claims not substantiated by facts. Both involve creating huge deficits and then don’t address how to pay for them or attribute greater future economic growth as the solution to the deficits. Neither has much of a track record to prove it. Most economists don’t have a problem with running deficits in bad times. But what we are currently doing is beyond short term deficits. It is structural, long term and can’t help but inhibit economic growth. In order to believe in Keynesian theory, you have to believe the Great Depression would have gone on longer than it did without massive government spending and programs. The same is true now. Neither can be proven. I just can’t find a historical case where the theory holds up. However, I can find in history all over the place that the business cycle repeats itself and anyone claiming there is an economic system that can tame that is full of………beeswax. Isn’t interesting though, how the major parties have flipped. The Dems of Jack Kennedy’s time were tax cutting believers who didn’t mind some deficits, while Barry Goldwater voted against JFKs tax cuts because he thought the deficit should be the priority. Today, JFK would fall into the GOP and Goldwater would be a Democrat. I mean a moderate Democrat, for it seems the Democrats have changed their position of deficits since Clinton. 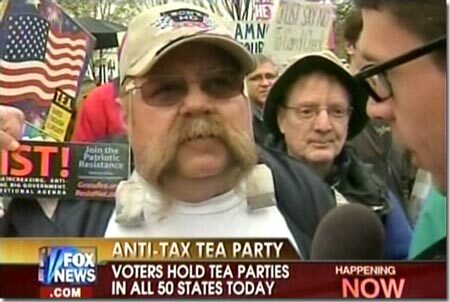 While journalists should be interviewing teabaggers when covering the deficit, they should also be interviewing some Paul Samuelsons to balance the discussion.